The IZT T1000 can be used to modulate broadcast signals, for example to test receivers during development or in production testing. The broadcast modulator is a good choice for stand-alone operation in fixed or smaller test setups. 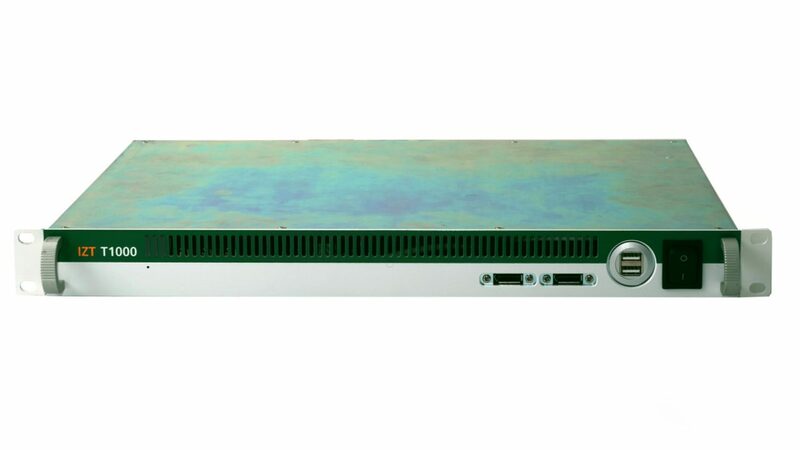 The IZT T1000 Broadcast Modulator is based on a fully reconfigurable universal hardware platform. The modulation is software-defined, allowing the platform to be upgraded to other broadcast standards. All input, modulation and RF parameters can be controlled via LAN using either the web interface or SCPI commands. The IZT T1000 covers the VHF and UHF band supporting the standards DAB and DVB-T/DVB-T2. It comes with an intuitive web interface which can be used with any – browser. In addition, the device can be controlled and monitored via SNMP or SCPI. For DAB, the IZT T1000 complements the DAB ContentServer Developer Edition, modulating the real-time EDI/ETI output of the multiplexer. Furthermore, the IZT T1000 can modulate a defined set of test signals to verify receivers, for example to confirm compliance to DVB-T(2) country specifications. The optional TSoIP Streaming Application passes the test signals to the IZT T1000. Used as an exiter, the IZT T1000 can feed existing power amplifiers. It comes with high-performance digital adaptive pre-correction for maximum transmitter performance. In case of DAB, the modulator can be combined with the IZT DAB ContentServer to form a comprehensive broadcast solution, for example for local “small-scale” DAB.